I hardly dare admit it but I’d never made chocolate brownies until this weekend so I decided that Halloween was as good as excuse as any to have a go. These are delicious. They contain more chocolate than can possibly be good for anyone but we’re not complaining. And we made them suitably scary with the addition of these ghoulish sticks of decorating joy. Pre-heat oven to 160C/gas mark 3. Put 3-4cm water into a saucepan and bring it to a simmer. Break chocolate up, cut up the butter, and place both in a mixing bowl. Put it over the pan of simmering water and turn the heat off. Stir until melted together and smooth. In another bowl whisk the sugar with the eggs, using the balloon whisk, until the mixture is smooth and creamy. Add chocolate mixture to the eggs; mix thoroughly with wooden spoon. Sift flour and cocoa powder and mix thoroughly. Stir in walnuts if you have decided to use them. Line the baking tin with a piece of foil and pour in the mixture. Oven gloves on. Place the tin on a shelf in the middle of the oven and bake for 20-25 minutes. Oven gloves back on. Take the tin out of the oven and stand on wire rack. Leave until cool enough to cut into squares. 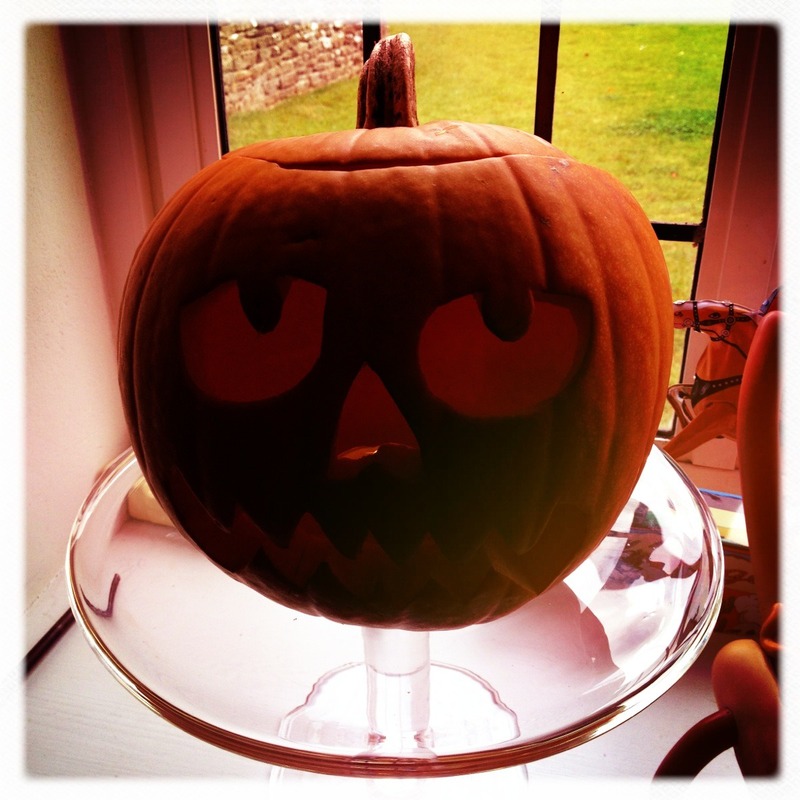 And to accompany my baking we of course had to have a pumpkin who, carved by my husband, looks like he might have overindulged with one too many brownies. Three whole weeks doing Absolutely Nothing…. We’re very excited to have the deliciously clever Helen Creese from Cafe Salvation contributing to ANTW. She will be sharing some of her most popular recipes from their wonderful menu and to start we have everyone’s favourite Winter warmer…..PIES! “I may well regret saying this but at last, it’s cold enough to get some winter warmers on the menu! The woodburners arrival in the café is imminent, so to keep us toastie in the run up to its installation, last week we cooked up our tasty Punjabi Pie. This dish reminds me of my childhood. My Dad is a fantastic cook and I spent most evenings as a kid whiling away an evening in the kitchen, chatting to my Pops whilst subconsciously absorbing everything he was doing. Pops is a fan of spice and loves to experiment with food, adapting recipes to better suit his tastes, and this dish is a prime example of that. Based on our British Classic, Cottage Pie, the secret to Punjabi Pie lies in the spice mix added to the onion and garlic during the first stages of cooking. For 500g of beef, start by frying one red onion and 2-3 cloves of garlic (depending on size of cloves and how much you enjoy the flavour). Add one stick of chopped celery and one diced carrot. When the onion and veg are soft, add a healthy palm-full (sorry, I don’t use measured devices, but if you cup your fingers to create a well in your palm, you’ll have the right amount) of ground cumin, coriander and half a palm-full of turmeric. Stir until aromatic, then add your beef to the onion and spice mix. Season well, add some tomato puree and fresh red chilli (quantity dependent on how hot you like it), and once the beef is browned, add a tin of chopped tomatoes. Half-fill your tin with water and add this to your mixture. Taste and alter your seasoning to suit. Wack in the oven for 30-40 minutes and crack on with your mash topping. Pops would use a mixture of potatoes and swede; I opted for pots and sweet potato (mainly because I like the colour and I eat with my eyes). Boil both veg – about 3 good sized potatoes and one sweet potato for 500g beef – in salted water until soft, drain and mash with plenty of salt and pepper and a generous knob of butter. We like to throw in some grated cheddar (again, it gives the mash a glorious golden colour as well as tasting yummy). Take the beef mixture out of the oven and pop in to your serving dish, spread the mash over the top (make it nice and thick, there’s nothing worse than an anorexic pie topping), and sprinkle on a bit more grated cheddar. Pop the dish back in the oven for about 25-30 mins (depending on your oven: I use an Aga, so in a conventional oven I’d have it on 190 for 25-30 mins). Once your topping is golden and smelling amazing, your pie is ready! Why not Pimp Up your Pies?! You can add a twist to most run-of-the-mill recipes, turning wet, weekday suppers in to dramatic delights, just with the addition of a few spices, fresh herbs, lemon or lime juice….it really can be that simple. I’m looking forward to taking the Punjabi Pie in to another realm: Sherpa’s Pie will involve lamb, fresh ginger, chilli, toasted cumin and coriander seeds, maybe some lentils and spinach…I’m undecided on my mash topping – any suggestions? I must have appeared rather rude as a child. I hardly ever thanked people in writing for any of the gifts received at Christmas or on birthdays. I’m not sure if I just didn’t see the point, or was just a bit too lazy, or had thanked them in my head and so thought that I didn’t need to actually tell them. It’s no wonder relatives got cross. I’d be furious. So now, be it as an act of guilt or a reaction to email over kill, I love nothing better than sending hand written cards. I have a drawer full of postcards and notecards which I can dip in to at any time when a “Thank You” or a “Welcome to the World” or a “Happy Birthday” is required. And I have a couple of favourite places I go to time and time again to find the perfect card. The first is Archivist. A small and perfectly formed printing press based in Oxfordshire who do the most beautiful letterpress cards as well as a Natural History collection (created from exclusive access to the NH archives) and hand printed notelets. You can buy them online or in selected retailers including John Lewis and Paperchase. The second is Nineteen Seventy Three. An online emporium with some of the most fabulous postcards, greeting cards, wrapping paper, invitations, notebooks and all sorts. With collections from various illustrators and artists including The Good Life, Darling Clementine, Belle and Boo and Sukie, there really is something for everyone. You can buy them direct from their online store or from various retailers. I could go on and on and on and there will be probably be many updates to this post. For now though, thank you very much. I was never really in to stripes for myself until quite recently. I have always been in to stripes for my boys. They just seem to suit them from end to end. Stripes have always been notoriously unflattering, they widen everything – I’m talking horizontal here, vertical is a whole different story and needs to be approached with extra caution. My children were both tiny babies and giant toddlers but regardless I wrapped them both in as many straight lines as I could get my hands on. The stripe – for adult or child – has to be right though and it’s worth investing a bit of time and money in to finding the ones which really do work. When it comes to the children I am a Polarn O Pyret addict. They do a stripe better than any other I know. From leggings – which I absolutely swear by for little boys – to long sleeved tees, all in ones, socks, hats and pants, they are the very very best. They have lasted me through two incredibly active boy babies and are still going strong. So, after years of telling me that stripes made his “eyes go funny”, my husband recently came back from New York with bundles of stripey offerings for both me and the children. I hadn’t asked for anything apart from a denim shirt from Levis – which he found and is perfect – but I did mention that J.Crew might be worth a visit if he did feel guilty for leaving me for 10 days that I might need anything else. That was as much direction as he was given and blimey did he do well. I am now the proud owner of 4 of the very best J.Crew stripey tops I never even knew existed. Each one a little bit different in colour or style and very well considered indeed. I would never have been this generous on myself. I’m in stripe heaven and I may be here for some time. So to end this rather self satisfied post about stripes you might be pleased to know that J.Crew have a UK online store now which is very good news for wardrobes everywhere. And there seems to be a bit of a sale on at the moment so definitely worth a look. Just found this one on J.Crew UK - in the sale. It's lovely. Central Saint Martins, the best 4 (college) years of my life. Wish I could go back and do it all over again.